Physician Arthur Conan Doyle takes a break from his practice to assist London police in tracking down Jack the Ripper in this debut novel and series starter. September 1888. A twenty-nine-year-old Arthur Conan Doyle practices medicine by day and writes at night. His first Sherlock Holmes story, A Study in Scarlet, although gaining critical and popular success, has only netted him twenty-five pounds. Embittered by the experience, he vows never to write another “crime story.” Then a messenger arrives with a mysterious summons from former Prime Minister William Gladstone, asking him to come to London immediately. Once there, he is offered one month’s employment to assist the Metropolitan Police as a “consultant” in their hunt for the serial killer soon to be known as Jack the Ripper. Doyle agrees on the stipulation his old professor of surgery, Professor Joseph Bell—Doyle’s inspiration for Sherlock Holmes—agrees to work with him. Bell agrees, and soon the two are joined by Miss Margaret Harkness, an author residing in the East End who knows how to use a Derringer and serves as their guide and companion. Pursuing leads through the dank alleys and courtyards of Whitechapel, they come upon the body of a savagely murdered fifth victim. Soon it becomes clear that the hunters have become the hunted when a knife-wielding figure approaches. As someone who enjoys Sherlock Holmes pastiches and nearly anything revolving around Sir Arthur Conan Doyle’s life outside of those stories, I was incredibly excited to see a new mystery (or mystery series, perhaps? Goodreads says it’s a series starter!) 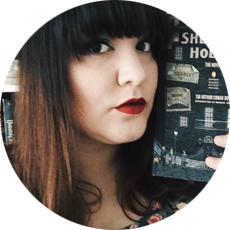 involving Conan Doyle, Bell, and Margaret Harkness. Bradley Harper’s A Knife in the Fog is incredibly well-researched and well-rounded. It’s difficult to get the tone and language of the time period to be believable without feeling as if it’s forced, and Harper manages to bring the style of the time forward to modern ears. A Knife in the Fog follows Doyle, Bell, and Harkness as they try to deduce who calls himself “Jack the Ripper” and his motives for attacking the working women of Whitechapel. There are numerous theories of the identity of Jack the Ripper, and Harper’s theory ties in believably in the scope of his novel. Margaret Harkness is a lively figure in history brought to life in the novel in such a way that charges the trajectory of the narrative. As a reader, I thought the addition of Margaret Harkness into the dynamic duo of Bell and Doyle was a necessary and wonderful addition to the story. While I won’t go into spoilery details, Harkness is one of the two women in this story who forces each Bell and Doyle to reconsider their assumptions and prejudices about women and women’s work. And given the traditional nature of these boys’ club mysteries, I was pleasantly surprised to see two women. I also liked the nods to various literary figures and future Sherlock Holmes stories scattered throughout the book as well. It was like hunting for literary clues. Overall, this is a well-paced, well-researched, and well-crafted mystery with just the right amount of flair and atmosphere. 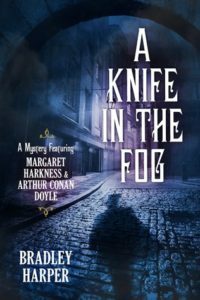 If you enjoy historical fiction/mysteries, Jack the Ripper stories, and Doyle/Holmes pastiches, I highly recommend you check out A Knife in the Fog! Thank you to Seventh Street Books for sending me a complimentary review copy! All opinions are my own.